Every January I’m ready to hit the ground running. I’ve got PIGs and POAs, abundant optimism and fresh determination to make the most of the new year. 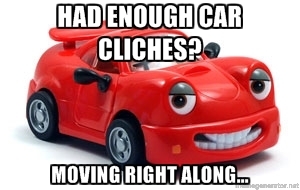 Chances are you do too. To be successful, you need S.M.A.R.T. goals. To sustain that optimism and determination through January and beyond, you might need a V8. To celebrate the new energy and fresh start of a new year, the Energy Drink of the Month for January 2014 is V8 V-Fusion + Energy. There are many flavors available, but this month’s pick is pomegranate blueberry flavored, which contains 50% juice. For the long road ahead, through the ups and downs toward your goal, to help you switch gears when you feel you’re spinning your wheels and going nowhere fast, let V8 be your fuel-of-choice. 1 – It’s an energy drink in disguise. 2 – V8 V-Fusion + Energy and Red Bull have the same amount of caffeine. Per 8 ounce can, both Red Bull and V8 V-Fusion + Energy deliver 80 milligrams of caffeine. 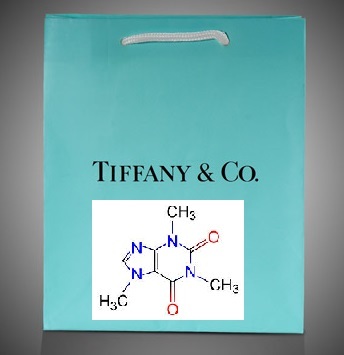 Every true chemist knows caffeine is caffeine is caffeine, but every girl knows a ring is so much better when it comes in a little blue bag. In other words, when caffeine is delivered via green tea extract, you’re not just getting the caffeine, you’re getting all the anti-oxidants and other beneficial components of green tea itself. 3 – It provides 60% of the number one most popular energy drink ingredient. According to Innova Market Insights’ Database, vitamin B12 is the ingredient most commonly added to energy drinks. This Energy Drink of the Month contains 60% of the Daily Value of vitamin B12. 4 – You’re supposed to shake it! That’s because it’s 50% fruit juice, not carbonated water. It’s natural for natural products to settle (think pulp in fresh-squeezed orange juice). The caffeine, green tea and juice content make this product a Level 2 in the 5 Levels of Fatigue*. 5 – B5 is missing, and that’s good. This energy drink has B1 (thiamin), B2 (riboflavin), B3 (niacin), B6 and B12. 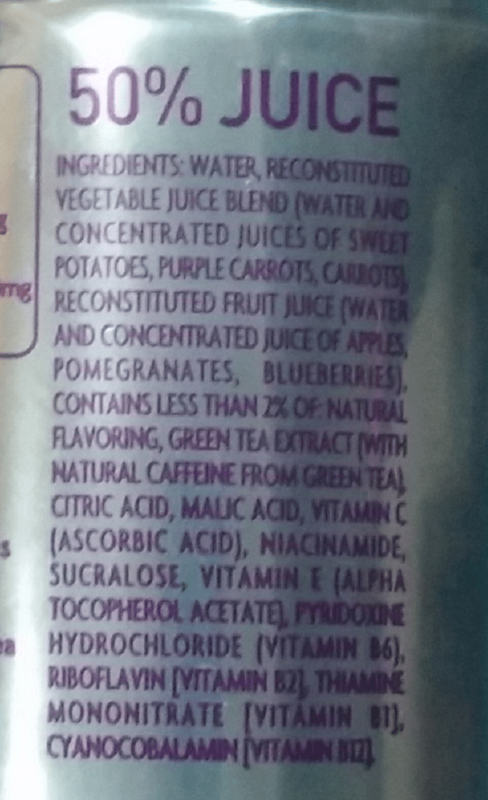 There is no B4 (don’t get metaphysical), and this drink contains no B5 (pantothenic acid). Why is this a GOOD thing? Because pantothenic acid is a RIDICULOUS ingredient to add. In Latin, “pantothen”‘ means “wide-spread”. Pantothenic acid is so prevalent in the American diet that there isn’t enough data to establish a value for the RDA. Instead, there’s a value for Adequate Intake (AI), which is basically the amount needed to replace the vitamin excreted in the urine. This may be a good time to point out scientists are often under-appreciated for their hard and dirty work. Someone had to measure out the vitamin excreted – probably a grad student. 6 – The 10 grams of sugar comes from fruits and vegetables. Specifically, the sugar comes from sweet potatoes and carrots, which are known in the R&D world for being the sweetest tasting vegetable powders and concentrates available. Apple juice is also very sweet, and it’s in here as well. 7 – Green tea and caffeine have a dynamic relationship. Caffeine may help you run farther and pedal faster but if you’re trying to lose weight, green tea is the way to go. A review of 11 different trials with green tea showed catechins (like EGCG) significantly decreased body weight and helped people maintain weight loss (Hursel 2009). But wait, there’s a catch. The people in these trials who normally drink more than 300 milligrams of caffeine per day didn’t get as big of an impact with their green tea treatment. 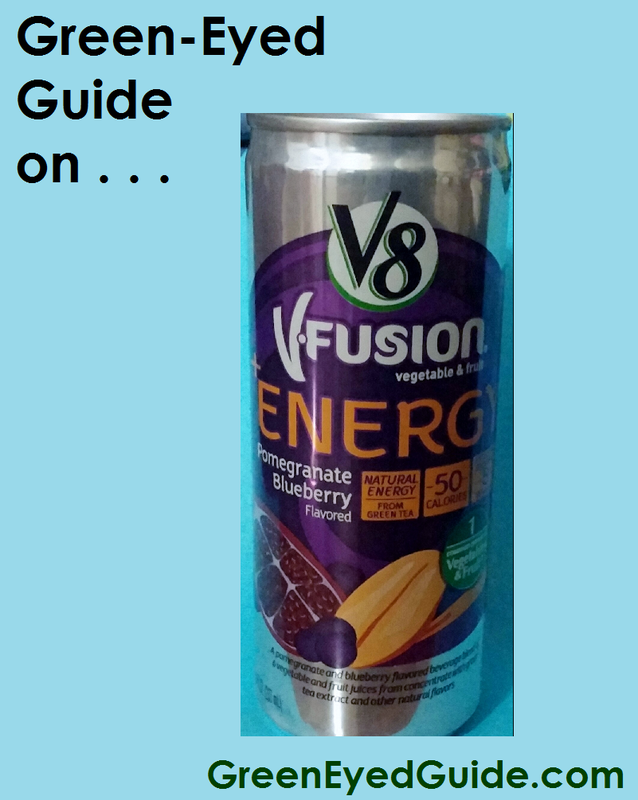 If you can’t live without caffeine but don’t have time to visit a coffee shop and don’t like the stigma of the stereotypical energy drink, V8 V-fusion is a healthy alternative – one that will give you the boost you need without the dirty or concerned looks from parents or coworkers. Not all energy drinks are created equal. Know the difference. *To learn more about the complexities of green tea versus caffeine, the 5 Levels of Fatigue and any of the B-vitamins mentioned above, flip through the caffeine reference guide, Are You a Monster or a Rock Star, available wherever books are sold. Follow the GreenEyedGuide on twitter, “Like” the Energy Drink Guide on Facebook and enter the monthly contest for your chance to win. Contests and winners announced every “Lucky-13th” of the month. ← Friends with the Monster (energy)?